Perfect for safe daytime solar viewing and searching for sun spots, our plastic glasses feature high quality and protective optics and are CE certified. 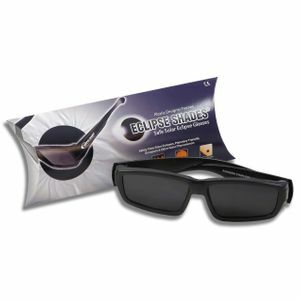 Enjoy the ease of wearing these over prescription glasses, and store them in the micro fiber pouch for safe future eclipses or sunspot viewing. Includes a glasses lanyard and a micro fiber pouch for storing and cleaning your Eclipse Glasses.